Whether your players are investigating a crime that has torn apart a formerly peaceful hamlet, stopping over in a small town for the night, or attempting to hunt down a fugitive, weary wanderers don't want to wait for a Game Master to draw every house and tavern. This Pathfinder Map Pack provides beautifully illustrated 5"x8" map tiles that can be used to construct a variety of village sites. Game Masters shouldn't waste their time sketching maps whenever characters decide to visit a quaint settlement. 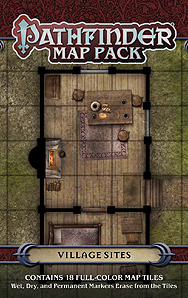 With Pathfinder Map Pack: Village Site, you'll always be ready to take your players into seemingly peaceful villages - and face the dangers within!